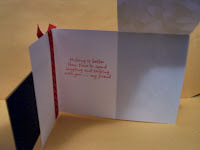 This card was made using the Flip Flap fold as featured in TJ online bonus this month. I LOVE this card! I will be making more of these for sure. Great way to show off some of that patterned paper I have been hoarding! I don't know why the pictures are small but if you click on them it brings up a HUGE one you can get a closer look at. I took these with my camera instead of scanning them...hmmmmmmm....maybe I need to resize them - didn't think of that till just now LOL! I used my semi-glossy white card stock from Hollo's for the base. I cut and folded it then added my folded piece of patterned floral paper from DCWV Black & White Prints Paper Stack. Then I added the red & black polka dot ribbon (I believe May Arts brand- not 100% positive though.) Tied it off with a simple knot and trimmed the ends. I used the leftovers from my card stock base and also my patterned fold to make a layered piece for the flap front. I added 3 silver mini brads along the bottom of the floral paper and then layered it on white which I used my Carl CarlaCraft corner punch on to make the little notches. Then matted it all with a piece of heavier black card stock also from Hollo's. 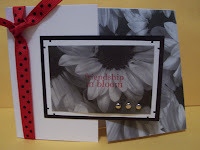 After I layered them all up and played around with the placement of it I thought I would set off the red & black polka dot ribbon with the words "friendship in bloom" from TAC Friends LE T-2591 stamped with L'Amoure Red Palette Ink. Inside the flap opening I also stamped the saying from TAC Nothing is Better T-675 with my L'Amoure Red Ink. As you can see it opens to the left (flip) and then up on the other ends (flap) You can write a short note inside the flap portion..